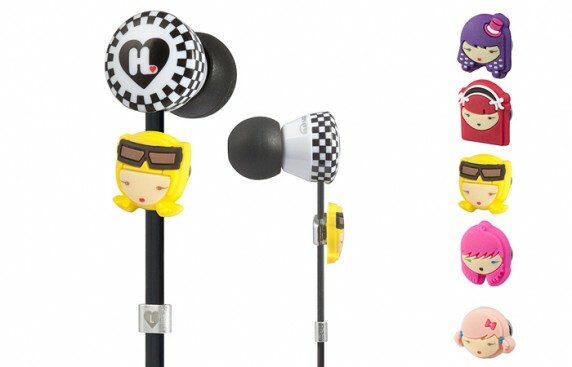 We’re pretty much blown away by these new pairs of Harajuku Lovers In-Ear Headphones from Monster and Gwen Stefani. Monster hasn’t just produced just one, but three adorable pairs of Harajuku Lovers In-Ear Headphones, each with their own wicked style. All of the headphones sport a tangle-free cable design, they come with multiple ear-tips, and they are affordable too. First and foremost is our favorite, the Harajuku Lovers Wicked Style In-Ear Headphones which features Interchangeable Faces and heart-shaped carabineers. This pair comes with five clip-on girls, or more specifically, G and four Harajuku girls. The headphones also come in a heart-shaped compact case and retail for $69.95. Next is the Harajuku Lovers Super Kawaii In-Ear Headphones which comes in a Harajuku Lovers Heart-Shaped Cable Manager, also sports Heart-shaped carabineers, and retails for $59.95. Finally, there is the Harajuku Lovers Space Age In-Ear Headphones which features Interchangeable Gwen Bodies. That means that the headphones come with five clip-on body colors. To top it off, the headphones feature a Retractable cord keeper. The Harajuku Lovers Space Age In-Ear Headphones retail for $89.95.